How Many Eggs Can Your Child Eat Each Day? 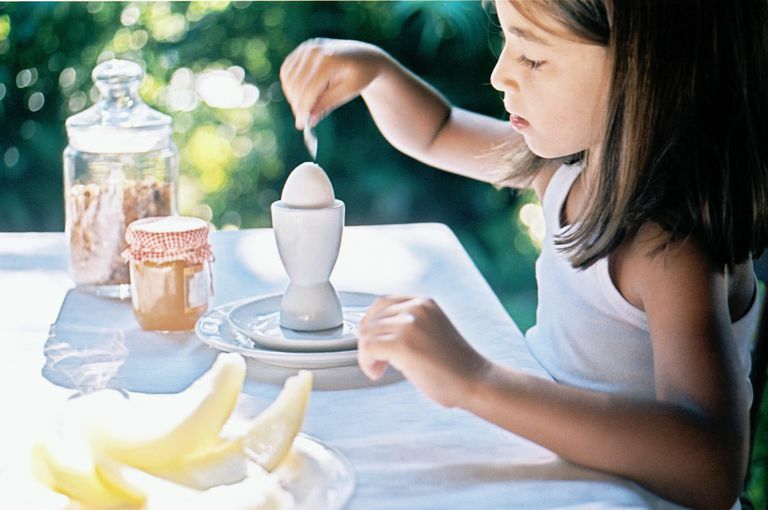 How Many Eggs Can Your Child Eat Every Day? Eggs can be a healthy part of your child's diet, but you may wonder what amount of eggs is appropriate. Dietary recommendations have shifted away from fear of the cholesterol in eggs. But you still need to balance whether your child is already getting cholesterol from other protein sources and whether your child is getting enough fruits and vegetables. Eggs have a lot of benefits, including being high in protein, iron, minerals and B vitamins. Instead of worrying about how many eggs your child eats, it is more important to look at and plan his overall diet by trying to follow the MyPlate guidelines. In these nutrition guidelines, eggs are a part of the protein food group. School-age children aged 9 to 13 should get five ounce-equivalents from this food group each day while younger children might have only two to four ounce-equivalents. In general, one egg counts as 1 ounce in the protein food group, but you usually wouldn't want a single food to be your sole source of protein for the day. In addition to the recommended daily servings of the protein-rich foods, it is important to look at how much cholesterol your child is getting from other foods. If he already has a diet that is high in cholesterol, with large amounts of whole milk, cheese, yogurt, processed meats, or ice cream, then eating eggs on a regular basis might not be a good idea. If his diet is low in cholesterol and saturated fats and he eats a lot of foods with fiber, then routinely eating eggs is probably fine. It is also important to keep in mind that the general recommendations for eating eggs include eggs that are eaten as an ingredient in other foods, such as cakes. For example, if you use four eggs to bake a cake and your child eats two of the eight pieces of the cake, then that is equal to eating one whole egg. The relationship between dietary cholesterol and how or whether or not it influences your blood cholesterol level is now better understood. Many experts criticized the old recommendations about avoiding eggs because they thought that it was much more important to limit the amount of saturated fat in a person's diet instead of limiting cholesterol. That is what most of the newer recommendations now say. Eating an egg each day is not thought to raise your blood cholesterol. An egg contains about 213 milligrams of cholesterol. Eggs are considered a good source of protein. Many people should eat fewer eggs, not because they need to get less cholesterol in their diet, but because they already eat too many high-protein foods. They should instead eat more fruits, vegetables, and other "under-consumed food groups." Delaying the introduction of "allergy foods" to infants, like egg whites and peanut butter, is no longer recommended as a way to prevent food allergies. Be safe when preparing and storing eggs. Dietary Guidelines 2015–2020. U.S. Department of Health and Human Services and U.S. Department of Agriculture. https://health.gov/dietaryguidelines/2015/guidelines/. Preventing Allergies: What You Should Know About your Baby's Nutrition. American Academy of Allergy Asthma & Immunology. https://www.aaaai.org/Aaaai/media/MediaLibrary/PDF%20Documents/Libraries/Preventing-Allergies-15.pdf.